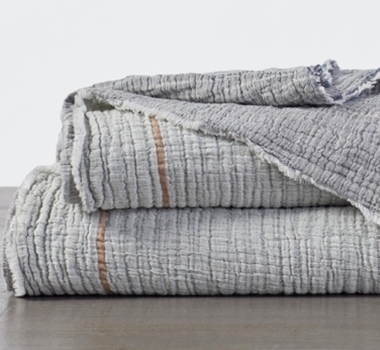 Matelassé woven from pure organic cotton, our Topanga blanket is whimsical, drapey and lightweight. It’s also conveniently reversible, with slim stripes on one side and ombre ripples of color on the other, so you can change the look of the bed with a quick flip. 100% organic cotton is grown and woven in India. Secured by a nearly invisible stay stitch, eyelash fringe edges all four sides. Yarn dyed and garment washed for soft color. All of our organic cotton products are machine washable. We recommend machine washing on the gentle or delicate cycle with like colors, with cold water and a natural, plant based laundry detergent. We do not recommend using whiteners, as bleaching agents may diminish the brilliance and depth of the colors; when needed, use only non-chlorine bleach. Line dry, or tumble dry low and remove promptly. Fabric softeners and dryer sheets reduce the absorbency of cotton textiles and are not recommended. Place a set of our wool dryer balls inside the dryer to naturally soften the fabric and reduce drying time. Use a warm iron as needed.